What is this word “Abbondanza”? Allow me to explain, and allow yourself to discover. Abruzzo is a region in central east Italy geographically and part of the south culturally. The Abruzzo landscape is made up of majestic mountains both rocky and with heavy natural growth, but also lush and fertile valleys, a coastline of both rocky cliffs and sandy beaches, ancient Roman ruins, medieval and renaissance architecture, modern cities, rural villages, mountain top towns, the most diverse food and agriculture in the country known for the best food and agriculture, and the people….OH THE PEOPLE! Abbondanza is a word in the Italian language that means ‘abundance’, but it is much more than just a word, it is a celebration or salutation or at times even used to wish someone good luck as if to say “may your journey/venture/studies be bountiful.” In Abruzzo if your plate is empty but there is still more food- “ABBONDANZA!” In Abruzzo when the harvest season comes- “ABBONDANZA!” In Abruzzo when you are feeling good from the wine and there is more to drink- “ABBONDANZA!” In Abruzzo, every day is ABBONDANZA! We will discuss all the things that make Abruzzo, Italy a place of abundance. But first we need to discover Abruzzo, because it is the most underrated and even unknown area of Italy. In the last couple of years there has been a sort of enlightenment about this, dare I say- a second Italian renaissance. 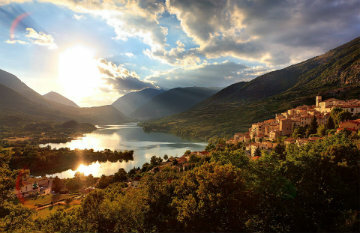 Indeed, some of the biggest news publications around the world have started to write about the beauty of Abruzzo and how it is relatively untouched compared to popular areas of Italy that we all know about, some of which have become almost cliché like- Venice, Amalfi Coast, Cinque Terra, and even Florence to name a few. Abruzzo is said to be “the greenest region” of Italy because it has vast national parks on which land is not open for residential or commercial development, and because using any kind of chemicals on the land is illegal here, and because we don’t need to use well-water when we have ample natural spring water flowing from the mountain tops to the valleys, and because the region has remained largely free from tourism. Abruzzo offers something different, something more, something fulfilling because of the region’s substance but also, something mesmerizing because of its natural beauty, and something sustaining because the rich soil produces foods the rest of the world cannot, including other areas of Italy that have long been thought of as the most fertile land in the world. Yes we are talking about you Tuscany! Abruzzo can go toe to toe with Tuscany, and we don’t even need to anglicize the name of this region like Tuscany for Toscana, both in Italy and everywhere else Abruzzo is Abruzzo. When you come to Abruzzo you are more than a tourist, you are an explorer, you will discover a land and sea that is not only unique but in many ways is like another world. In a book from 1903 titled “In the Abruzzi” Anne MacDonell wrote of Abruzzo- “a land strange and uncouth, little distant from Rome in mileage, incalculably distant in everything else”…“to cross it’s rugged frontier is to find yourself at but the first of its many defenses against the life of today” and “here man has never conquered”. Indeed, a common feeling when someone visits Abruzzo for the first time is that they have been whisked away to a different universe. And the people will treat you like family, close family. I am Italian-American with a long family history in Abruzzo and in America it has happened many times when I’ve dined at an Italian restaurant that the staff or owners ask where my family is from, and when I answer “Abruzzo” they say- “Ah! Abruzzese are the best! THE BEST!” The hospitality, the sense of belonging, the feeling and comfort of family, these things come natural to the Abruzzese and they easily transfer that to visitors. So why and/or how has Abruzzo remained so unknown for so long, especially in this day and age when information travels across the globe in less than a second? Well, that is a mystery we hope to uncover…with you. When you come as a guest of AbruzzoCibus you will better understand the secrets of Abruzzo, and you will leave not just as a guest, but as family.